What: Feeling autumnal, anyone? This October, we'll be hearing from Fatima Farheen Mirza, author of A Place for Us – the first book selected for Manhattan legend Sarah Jessica Parker's imprint at Hogarth – at the LIVELY Experience Store in Soho. A Place for Us is a fantastic novel themed around change, culture, and familial history: something we think resonates a lot around this time of year, and we're so excited to have Fatima join us for the conversation. As always, we invite you to respond to the prompt literally and figuratively: the meaning and history of habit, the things we pass from child to sibling to family, and the burdens of upholding ritual amid change. We want to know: what does "Tradition" mean to you? 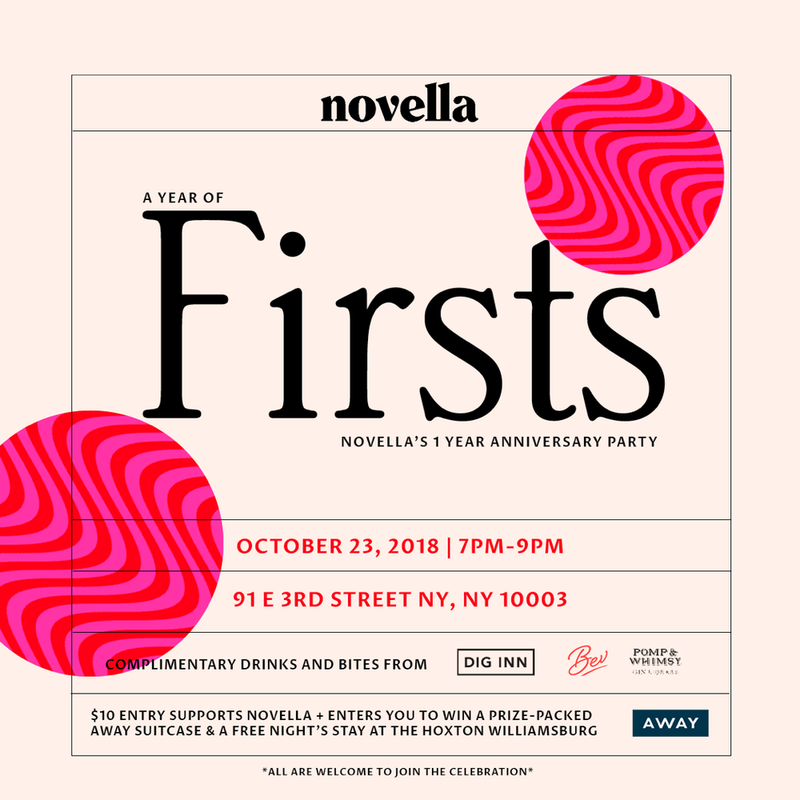 WHAT: We could not be more excited for this - Novella's One Year Anniversary Party! It has been a year of hugs, a year of laughter, and a year of your stories being shared within this incredible community of ours. As both the first and last person on any dance floor, our Founder Abby Adesanya could not resist throwing it back to our first prompt ever "Firsts" and hosting a little shindig to celebrate our inaugural circle around the sun. Tickets are only $10 and that includes 1 Raffle Ticket for our Away suitcase from heaven (you can snag more chances at the party or at checkout!) and all the bites and drinks from Dig Inn, Bev Rosé, and Pomp & Whimsy Gin Liqueur we can provide in a 2-hour period. Your ticket also supports the growth and longevity of the space we've created in the past year, so thank you. Sound like a plan? Wonderful. SNAG YOUR TICKETS HERE & TELL A FRIEND! What: We're so excited to return with the tenth salon, this time at the LIVELY Experience Store in Soho, where we'll be joined by Marjon Carlos, cultural critic and former Vogue.com Senior Fashion Writer. Together with Novella Founder & CEO Abby Adesanya, we will discuss Marjon's experiences in the fashion industry, transitioning to freelance from full-time, and a personal interpretation of what "change" means to her. As always, we invite you to respond to the prompt literally and figuratively: how we are constantly evolving as people, touching on the feeling of newness (back to school, anyone?) that comes with each September, and the transitional nature of seasons.. We want to know: what does "Change" mean to you? Space is limited—RSVP* here but remember that when you do, you’re committing to attending and writing an original piece. Please click wisely - your RSVP takes up a seat and we need those! What: We're thrilled to announce our ninth (and last of the summer!) salon at Lou & Grey Flatiron, where we'll be joined by Glynnis MacNicol, author of her debut memoir, No One Tells You This. Glynnis will be in conversation with Roxanne Fequiere, Novella's Editor-at-Large and co-host of The Wing's Book Club in Flatiron. Together, they will discuss Glynnis' experiences as a writer, the stories behind her memoir, and a personal interpretation of what "age" means to her. As always, we invite you to respond to the prompt literally and figuratively: from the concept of milestones, to if age is really just a number, to how it impacts your view of the world. We want to know: what does "age" mean to you? NOT IN NYC? You're in luck. We'll be livestreaming from Instagram where we'll be taking questions for Glynnis from our members. We’ll eat, drink, listen, and share, with sips and snacks provided courtesy of our friends at Winc (use the special code NOVELLA for a sweet discount) & Caroline Schiff! 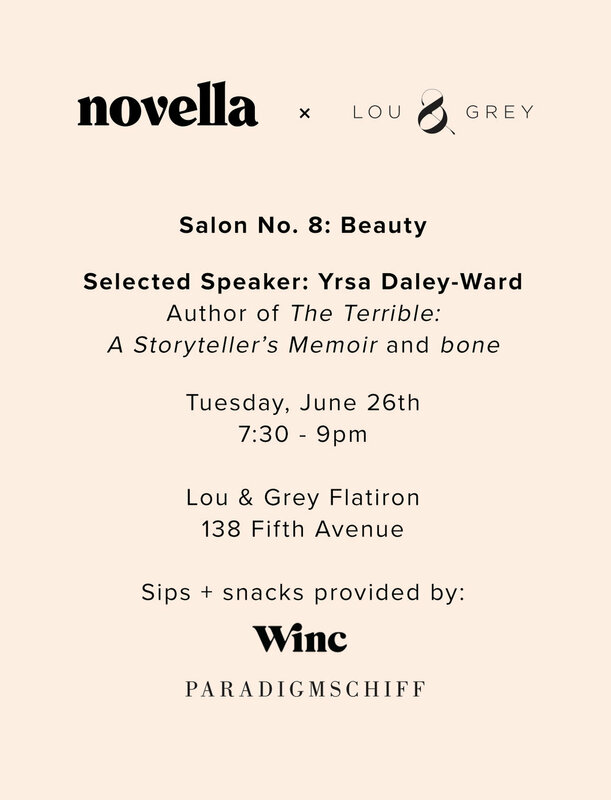 What: We're thrilled to announce our eighth salon at Lou & Grey Flatiron, where we'll be joined by Yrsa Daley-Ward, author of bone, and the incredible memoir, The Terrible. Yrsa will discuss her process as a writer, the stories behind her work, and her personal interpretation of the prompt "Beauty." Space is limited—RSVP* here but remember that when you do, you’re committing to attending and writing an original piece. Please click wisely - your RSVP takes up a seat! NOT IN NYC? You're in luck. We'll be livestreaming from Instagram and in our private Facebook group Women of Novella, where we'll be taking questions from our members.